Adelaide, the capital of South Australia, is known as the "city of churches". This gives a clue to its history. Many of its early inhabitants were religious refugees from Germany. Their influence can still be seen in the food and music. Adelaide is set on a narrow coastal plain between the hills of the Mount Lofty Ranges and Gulf St Vincent. The Torrens River runs between Adelaide and North Adelaide, surrounded by parklands. 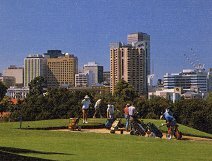 Adelaide is noted throughout Australia for its well-planned city streets and profusion of civic parks and gardens. The city is laid out in a grid pattern, making it very easy for visitors to find their way around. Internationally the city is known for its biennial arts festival which brings together some of the world's best performing artists. 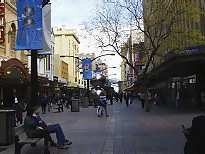 Rundle Mall, with over 820 shops, is the shopping centre of the city with big department stores. Boutique shopping is at the eastern end. Trading hours are Mon-Fri 9am-5.30pm, extended hours on Friday night. Sat 9am-5pm, Sun 11am-5pm (in the city only). Adelaide International Airport is 5km from the city (ten minute drive). The flight times given above are a guide and should be checked with the airline. For more detailed information visit the Qantas, or Virgin Airlines website. Port Adelaide is an international port with passenger services from Europe and the Far East. The interstate train terminal is south-west of the city centre in the suburb of Keswick. Adelaide/Alice Springs/Darwin - "The Ghan"
Interstate buses arrive at Central, almost in the centre of the city. For coach travel details visit the McCafferty's Coaches website. March: Adelaide Arts Festival for three weeks at the beginning of March. 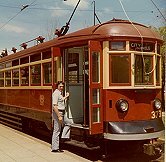 for more info visit the City of Adelaide, South Australia website.